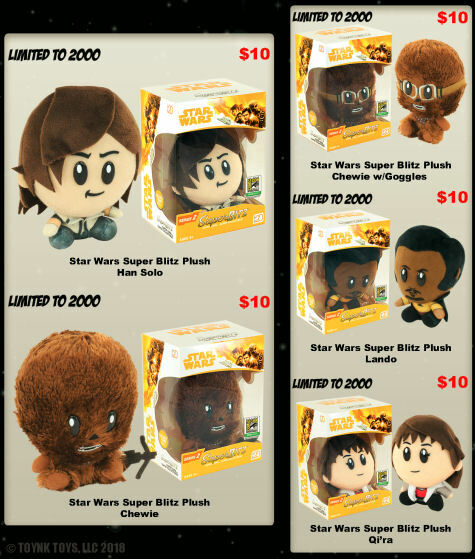 Depicting four core characters from Solo: A Star Wars Story (plus one variant), these Super Blitz Plush toys are sure to be a hit. Limited to two thousand and priced an affordable $10 each they can only be bought during San Diego Comic Con (July 19th to 22nd). Toynk Toys are at booth numbers 815, 4437, & 5245 - where you can also pick up their exclusive Star Wars original trilogy movie poster pin set - and will be attending San Diego Comic Con for the full duration of the event. Check out our handy-dandy SDCC 2018 exclusives guide to keep track of all the Star Warshard to find that will be at the show.